Above: Visitors in La Jolla Cove stand on the bluffs along the ocean, Nov. 19, 2015. La Jolla Cove has been named the fifth-most polluted beach in California by the annual Beach Report Card from the environmental nonprofit Heal the Bay. The report assigns letter grades to 416 beaches along the California coast based on levels of weekly bacterial pollution, which indicate whether a beach is safe for swimming without making you sick. La Jolla Cove had the fifth-highest number of weekly failures behind Clam Beach County Park in Humboldt County, San Clemente Pier in Orange County, Cowell Beach in Santa Cruz County and Lakeshore Park in San Mateo County. Heal the Bay has done a report card every year for the past 25 years, and this is the first year La Jolla Cove has been on it. She said there would need to be more research into whether the animals were responsible for the increase in bacteria. La Jolla has long been plagued by stench coming from animal poop on the rocks. 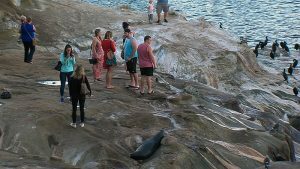 Residents and business owners have explored numerous options, including installing rotating cylinders that would roll the seals and sea lions back into the water. But nothing has yet worked out. The cove received “D” grades last summer and during the wet winter season, down from a “B” grade in the summer of 2015 and an “A+” in the winter of 2015. While Imperial Beach has gained attention this year for a major sewage spill, Sikich said it did not make the most-polluted list because it did not have as high a frequency of failing grades. Most of the 75 beaches the nonprofit monitors in San Diego County performed well this year, with 97 percent earning A or B grades during dry weather. However, in wet weather only 68 percent earned A or B grades.